St Patricks Day is coming so lots of online casinos will have casino bonuses this month. 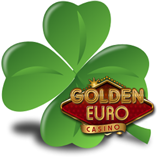 If you're in Europe, check out the St Patricks bonuses at Golden Euro Casino. There'll be a surprise casino bonus for all depositing players on St Patrick’s Day, March 17th but the "luck of the Irish" celebrations continue all month long. The biggest event of the month, though, is the month-long €1000 Irish Luck Free Roll Slots Tournament that 's just begun. A Facebook contest and a special comp points offer will also continue for the whole month. Golden Euro is inviting players to "like" their new casino Facebook Page. Like them this month and you could win a €100 Casino Bonus. The Irish Luck Free Roll Slots Tournament which has a guaranteed prize pool of €1,000, will be played on Triple Twister, a tornado-themed slot game that’s had a history of generous payouts. We all have until March 31st to get the highest score on the game. Also this month... earn Double Comp points when you play the Leprechaun-themed Lucky Last slot game. Comp points can be redeemed for cash. May the luck o' the Irish be with you this month!